Dååth (sometimes written as "Daath") is one of the most well-known and most hyped bands of the New Wave of American Heavy Metal. Most "trve metal" folk rip on them, probably because the band is now associated with both Roadrunner and Century Media. If you hate them because they're not kvlt enough, maybe you should read True Metal vs. False Metal instead of reading this review. If you like DevilDriver , Lamb of God , Machine Head , or Fear Factory , read on. Though they're often cited as an industrial death metal band, Dååth is not exactly Zyklon or The Berzerker . More accurately, they're an industrial groove metal band with some melodic death influence. In other words, they're a cross between DevilDriver and Fear Factory. As with the band's previous material, you'll find blastbeats mixed with industrial sounds, heavy mid-tempo riffs, fast riffs, and black metallish distorted vocals. This self-titled album is their fourth full-length. Sadly, it doesn't really offer a whole lot of evolution for the band. Highlights like "Indestructible Overdose" and the extremely catchy "Accelerant" are perfect examples of the great songwriting this band is capable of. But there seems to be more filler on this album ("Exit Plan", "Manufactured Insomnia", "A Cold Devotion"). That's probably due to the band's core members overextending themselves. The excellent The Hinderers came out three years after the band's debut , and the very good The Concealers had another couple years to brew. In contrast, this one is coming out a year after The Concealers, and just months after the debut from Levi and Werstler's side project . The Verdict: There are a few excellent tracks to be found here, but the majority of the album is forgettable. That seems to be the new pattern for Century Media. I give Dååth 3 out of 5 stars. The Crown is a Swedish melodic death/thrash band who recently reunited after a six-year break. Earlier this month they released their fifth full-length, Doomsday King . Being Swedish, and being a melodic death/thrash band, you might expect them to sound kind of like a cross between The Haunted and later At the Gates . If so, your expectations should be fulfilled, as that's just what this album offers. I've never listened to The Crown before, so I can't make any comparisons to their earlier (highly regarded) work. But the band plays fast and tight, and the recording sounds natural. The songs are solid, with engaging variety. The title track has some Middle Eastern inflections, "Age of Iron" is fast Slayer -like thrash, "The Tempter and the Bible Black" is slower and heavier, and closer "He Who Rises In Might - From Darkness to Light" borders on the epic. "Soul Slasher" is the weakest track in sight, but even that's not awful. "Through Eyes of Oblivion" is the highlight. The Verdict: There's nothing groundbreaking about this, but it's a very solid album that stands out from the legions of the thrash resurgence based on sheer quality. I give it 4 out of 5 stars. When most people think of death metal, they think first of the original death metal scene of Florida: Death , Morbid Angel , and Atheist . Or, they might think of the more accessible Swedish scene: Dark Tranquility , Unleashed , and In Flames . But the scene that took death metal to its logical, brutal extreme is in the state of New York. Let's look at three of New York's finest. Incantation formed in 1989, and their debut Onward to Golgotha was released by the venerated Relapse Records in 1992. Though they later moved to Pennsylvania, they are originally a New York band, and this album is one of the first examples of the ultra-heavy New York death sound. It was recorded with an extremely raw and dirty production, but you can still hear every instrument (and death grunt) in the cacaphony. Incantation proved that death metal could be even scarier when it's slowed down, and they change tempos often (see "Blasphemous Creation"). The cyclical riffs and unintelligible grunts, both staples of NYDM, demand your attention and keep things interesting throughout. There is no low point on this album, and I give it 4.5 out of 5 stars. Jerry Bruckheimer makes movies for people who don't know a good movie from a traumatic brain injury. That's what Cannibal Corpse is to death metal. The exact opposite of that--death metal for people who know good death metal--is created by Suffocation . They are the Kubrick or the Coen Brothers of death. William York of Allmusic said this of the band: "Many bands have attempted to copy Suffocation's sound, and most of them are extremely boring because they either don't grasp the subtleties or don't have the intuition that these guys obviously possess as songwriters and musicians." 1995's Pierced from Within was easily their masterpiece (at least until they re-formed in 2003). Hobbs and Cerrito are two of the best ever to weild the axe, and they work together on a level the equal or better of any other pair in metal. Every riff, every solo, every drum beat on this album is essential, and Mullen's death growl is one of the best in the business. The bass, also, is excellent (see "Depths of Depravity" or album standout "Brood of Hatred"). Pair all that with perfect, raw but clear production, and you get a 5 out of 5 star album. Having formed in 1986, Immolation may be the first major NYDM band, and their album Majesty and Decay from earlier this year proves that they're still going strong. It's their ninth full-length, and they crush everything like a steamroller as always. "A Glorious Epoch" displays the power of slow death and cyclical riffing as much as the material from nearly 20 years earlier. The production is crisp and clear, but the sound of the band itself is still raw and filthy (they don't need bad recording as a crutch). The drums do sound strange and over-processed, though. I give it 4 out of 5 stars. These ought to scare everyone on Halloween. Gloria Morti is a Finnish melodic blackened death metal band, whose debut album was one of my favorites of 2004. Their third album, Anthems of Annihilation , came out recently. Their sound is blackened death metal with the added benefit of synthesizer, which is used with wise restraint. The music is well-written and well-performed, and it's relentless. Their vocalist is one of the best in the business, moving effortlessly between bone-shattering growls and bloodcurdling screeches. The riffs can be catchy as hell ("Obey"), they write emotional music ("Awakening of a Discordant Machine"), and they have some great leads, too ("The Final Framework"). Despite all that, I'm disappointed. Not because this is a bad album, but because they haven't evolved. In fact, it's quite the opposite. You might expect a band's debut to sound like Band X + Band Y, but by the second or third album they've developed their own identity. Gloria Morti's debut had a distinct identity of its own, but now they sound pretty much like Behemoth plus early Dimmu Borgir (when they still used synths for their "symphonic" side). The Verdict: Anthems of Annihilation has everything you could possibly want--from a debut album. But since it's Gloria Morti's third album, and their first was such a great one, it's a bit disappointing. Still, I would recommend it to fans of Behemoth, at least if you can't find Lifestream Corrosion . I give it 3.5 out of 5 stars. Therion bears the distinction of being the first true symphonic metal band, after starting in their early days as a fairly straight-forward death metal band. I've been a fan of the band for a number of years now, and I was eagerly anticipating their fourteenth full-length, Sitra Ahra. It came out this week in the US (it's been out for more than a month in Europe). This album seems to be their most ambitious effort to date, combining many different styles beyond simply classical symphony and heavy metal. And most of the album is good. But as with many ambitious projects, sometimes the people working on it bite off more than they can chew. The problem with the album is that they made the weaker tracks longer, and put more of the weak material up front. It's very hard to get into, and harder to keep your attention focused. Compare the best track on the album to the worst track. "Din", clocking in at 2:37 and coming in second-to-last, is by far the best track, and blends Therion's death metal roots with their symphonic metal evolution to great effect. It's also the shortest track on the album. The longest track is also the worst track: "Land of Canaan" clocks in at over 10 minutes, and comes in at track 4. It takes orchestral pomp and combines it with circus/gypsy melody, 70's prog rock, rock opera, blues harmonica, and folksy flute. If that sounds like an ungodly mess, that's because it is. I have to wonder if it's a joke at the listeners' expense. That's not to detract from the other good material on here, like "Unguentum Sabbati" or "Kali Yuga Part 3: Autumn of the Aeons", but there's a lot here they tried to do, but couldn't do well. The Verdict: This album is only for fans of the band or the genre. Others would be wise to pick up some of their better material, like Lemuria/Sirius B or Secret of the Runes . I give it 3 out of 5 stars. New York sludge/doomsters Unearthly Trance released their fifth full-length last month. Approrpiately, it's called V .
They're a Relapse artist, and Relapse isn't exactly known for doom metal. But it is known for sludge, and for experimental artists, and that's exactly what you'll find here. The band name is perfect, as their compositions seem to be built around simple riffs designed to put you into a trance state, with other sounds building atmosphere and lots of interesting lead guitar coming in as the songs progress. Discordant notes are used beautifully in both rhythm and lead sections. The vocals are nothing to write home about, but they're not bad either. It seems aimed more at audiophiles than riff-heads. Normally I consider myself a member of the latter camp, but this album works for me anyway. As a rule, the longer tracks (6 or 7 minutes) are the better ones, because they have time to fully explore the trance-inducing riffs, but the shorter tracks are necessary to the album as a whole. It also seems like the songs get better as you get further into the album, but I suspect that's because you come to understand their songwriting better the longer you listen. Overall, the highlight is probably "Into a Chasm", but nothing on here is waste. In a way, this is like an alternate-reality version of Isis , if they had taken the sludge/doom of their early releases and gone in a darker direction with it. But to be sure, no one will mistake Unearthly Trance for a post-metal band. The Verdict: This is awesome sludge/doom built on atmosphere and atonality, designed to be listened to in the dark, with the volume turned all the way up. And it works. I give it 4 out of 5 stars. In anticipation of Monster Magnet's newest album , I thought I'd review Solace's A.D. Solace is a New Jersey band that's a rare animal: stoner metal. Sure, there are stoner rock bands, and there are stoner doom bands, but a pure stoner metal band is not too common. They formed in 1996, about the height of the stoner rock/doom/metal phenomenon. Even though they've been around for 14 years, A.D. is only their third full-length. They sound like a heavier version of Monster Magnet , right down to the Wyndorf-like nasally vocals, with hints of Remission -era Mastodon (mostly on the first couple tracks). Many of the tracks are slower for the first half, and then speed up for the second half. Album highlight "Six Year Trainwreck" is no exception (a song title which might suggest why they haven't had an album in 7 years). There's a lot of great groove, some southern comfort, and those signature stoner metal solos. The production is good, and they've captured the fuzzy sound perfectly. The songwriting is a bit predictable at times, and some of the songs tend to be a bit forgettable. But there's also a lot of strong material on here, and their sound is highly enjoyable. The Verdict: This is a worthwhile album for anyone who's a fan of the style, but probably won's be mind-blowing for anyone who isn't. For sludge metal fans too young to remember stoner metal, this would be a decent way to expand their horizons. I give it 3.5 out of 5 stars. 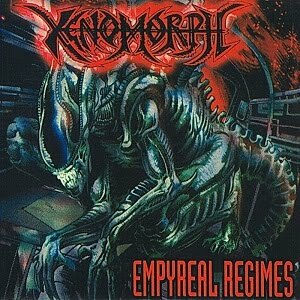 I first heard about Xenomorph from Metallattorney. There is apparently a Dutch band by the same name, but this is the technical death metal band from Omaha, Nebraska I'm talking about here. The album starts on an Orff -ish intro before moving into the death. The songs are progressive and tend to be fairly long (6 to 8 minutes). The vocals are nothing special, and you can't really make out the bass, but the drums and guitars are spectacular. The extremely clever solos sound a bit like a slow-motion Kerry King , but with a twist (check out "Subspecies" or "Inducted Through Time" for great examples). Thematically, I wish they would have stuck with the sci-fi horror theme implied by their name. Instead, they explore Nazism, exorcism, and ancient Egyptianism (I thought I needed a third -ism), complete with samples. Highlights include "Inducted Through Time", "Plight of the Cimmerian", and "Valley of the Kings". The Verdict: This is amazing, unique death metal, from an unexpected place, and absolutely worth finding a copy (no easy feat). It's a crime they never recorded another album or got a record deal. I give it 4.5 out of 5 stars. Death Metal Toddler: "Daddy Music!"